For his latest opera composer Andrew Ager has taken on very contentious subject matter – Hitler’s last ten days in his bunker in Berlin. Before people begin to wonder if the world is ready for a singing Hitler, they should stop to consider that Ager’s subject matter has already been made into at least four films with such actors as Alec Guinness (1973), Anthony Hopkins (1981) and Bruno Ganz (2004) playing the Nazi leader. An opera on the subject, therefore, should not be so surprising where film has already gone before. Besides this, the operatic repertory is already populated with some of the most infamous villains of history – Nero in L’Incoronazione di Poppea by Monteverdi, Tamerlano by Handel, Attila by Verdi. In only 45 minutes and ten scenes Ager depicts the last days of Hitler and his entourage in their life underground as the Third Reich collapsed and the Russian Army was poised to overrun Berlin. Ager has stated that he hoped to capture in the opera same kind of surreal atmosphere that Oliver Hirschbiegel did in his film Der Untergang (Downfall) in 2004. In this, Ager succeeds completely. He shows us leaders responsible for the deaths of millions of people who now live together knowing that the question is not whether they will commit suicide but when. Life in the bunker is a microcosm of what is happening outside where Hitler has led Germany into a kind of mass suicide. In a key scene Albert Speer (Andrey Andreychik) comes to tell Hitler (Jonathan Russell MacArthur) that he has not carried out the Führer’s orders of destroying all roads, bridges and railroads. Speer says he has disobeyed orders because it would prevent Germans from escaping the oncoming troops. Chillingly, Hitler replies that Germany has betrayed him and it deserves death for its betrayal. Among the bizarre scenes of the opera, all historically documented, are Hitler’s marriage to his mistress Eva Braun (Sydney Baedke) shortly before they commit suicide, Eva’s mingling with the soldiers in the bunker who are partying as if it is the last party they will ever have and Hiltler and his friends enjoyed a bit of Kaffee und Kuchen, during which Hitler spends most of the time speaking to his dog Blondi and explaining how she understands what he says. Ager’s music, appropriately enough, is uniformly grim. The piano, the only accompaniment played by Ager himself, sounds a brutal atonal fugue that continues relentlessly throughout the action taking on some variations in tempi and form but never changing its overall character. On its own it might remind some listeners of the kind of music Elmer Bernstein used to write to accompany Hitchcock thrillers. The voices sing over this fugal ground in lines that according to the character are are more or less melodic. Traudl Junge (Kelsey Taylor), Hitler’s young private secretary new to Hitler’s inner circle is given the most melodic lines, whereas Hitler’s are the most jagged. The lines are mostly short and distinct although Ager does allow them to overlap occasionally. The overall impression is of a 45-minute version of the severe recitation of the Two Armed Men in Mozart’s Die Zauberflöte (1791) before Tamino and Pamina are tested. The most extended sequence occurs when Hitler asks Goebbels (David Roth) to read to him about the “Miracle of Brandenburg” from Thomas Carlyle’s 1865 biography of of Frederick the Great of Prussia. This was the name that Frederick II gave to the failure of Russia and Austria, after a major victory over Prussia in 1759, to conquer and occupy Berlin. Only this once does Ager allow a singer’s lines to take on a more romantic tone. This again suits the action since Goebbels is reading a romanticized account which in turn is being used to feed Hitler’s delusions. 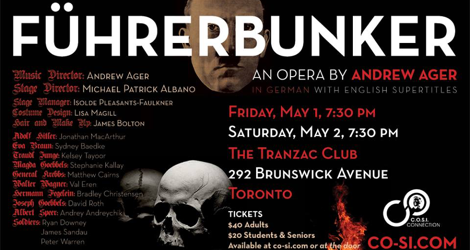 The main difficulty with Führerbunker is the same as that in Ager’s earlier opera Frankenstein (2010). The work is simply too short to provide a full exploration of the subject matter. Having seen both, I think I understand Ager’s aesthetic of minimalism. Like playwright George Büchner (1813-37), who wrote Woyzeck (1837) – that Alban Berg later set to music as the opera Wozzeck (1925) – Ager writes short, succinct scenes aimed at making a single point that end immediately that point is made. Yet, repeatedly a scene concludes just when we think Ager will expand upon the point it has made. But that is not his way. Nevertheless, I was much more willing to accept this highly compact method in Führerbunker than I was in Frankenstein, simply because there is no extended narrative to be told in the present work. A kaleidoscope of short scenes, in fact, helps convey the fragmented nature of the characters’ lives. whether to stay with the Hitler circle or try to escape is only plot line we care about. Yet, Ager never makes clear within the opera who she is. Were he to include a scene where Hitler dictates his will to Junge, Ager could make her role clearer to us as well as provide an extended scene for Hitler. The first part of the will would demonstrate its banality. The second part concerning the future of Nazism would further demonstrate his delusional nature. Ager has Goebbels’s wife Magda (Stephanie Kallay) mention more than once the suicide pills that everyone carries. A scene that Ager could have added would be Magda’s poisoning of her six children. Not only would this horrific and powerful in itself, but as the wife of Hitler’s propaganda minister, the poisoning is also rich in symbolic value. Director Michael Patrick Albano decided that there would be no curtain call following the performance, meaning the audience would not be forced into the awkward situation of applauding Nazis as if we could not separate the singer from the role. This would be fine except that it left an audience unfamiliar with the work wondering for too long if the piece was over or not. Since the production used surtitles to translate the German text, it would have been simple at the conclusion to have projected the word “End” as a signal. How to cast the role of Hitler must have posed a problem. Does one really want a ringing heroic voice or one of deep authority? As it happens, Jonathan Russell MacArthur (last seen as Damon in Toronto Masque Theatre’s Acis and Galatea) was chosen. He has a light, shallow tenor with a strong vibrato. In relation to the pounding rhythms of the piano, his voice generally came across as expressive but weak. Strangely enough, this voice type is exactly right for Ager’s characterization of Hitler. MacArthur happens to be a fine actor and created a portrait of a man whose delusions have closed him off from all those around him. Physically, MacArthur’s crumpled posture and staring eyes gave the impression of a man in the process mentally imploding. Significantly, Albano directed the piece in a kind of documentary style so that our sympathies were deliberately never engaged by what we saw, with Junge perhaps as the only exception. Her fate would have been clearer if Albano had had her escape from the stage as the lights faded rather than remaining on stage and leaving those who do not know her story in doubt about her fate. Junge aside, Albano, like Ager’s fragmented libretto, forces us to observe and judge the action rather than to be drawn into it. All three women – Baedke, Taylor and Kallay – sang with clear strong voices, while Andreychik and Roth stood out among the men. Whether Ager intended to have the opera accompanied only by piano is not clear. There were also recorded sound effects of bombs exploding, gunshots and low-flying planes. A chamber orchestra consisting of a piano quintet and percussion might be a good choice with the percussion taking over the role of the recorded sounds. All in all, Führerbunker proved to be a oddly powerful though oddly brief experience. One might imagine it on a double bill with an opera like Der Kaiser von Atlantis (written 1944) by concentration camp victim Victor Ullmann (1898-1944), pairing an allegory of death in the Third Reich with a portrait of its reality. Another pairing would be Ager’s own Frankenstein with the opera – both treating the punishment of man’s hubris. While the subject matter will likely put off other producers, I’m glad that the COSI Connection production (Centre for Opera Studies in Italy) had the courage to stage this world premiere. Ager and Albano demonstrated admirable tact in depicting an important piece of history with a coldly critical ear and eye that cut any attempt at glorification dead in its tracks. 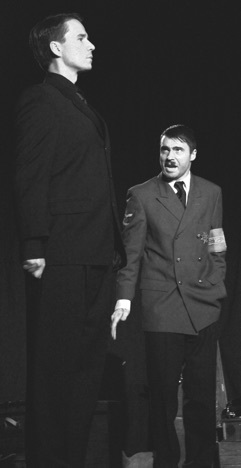 Photos: (from top) Poster for Führerbunker; Andrey Andreychik as Albert Speer and Jonathan Russell MacArthur as Adolf Hitler; Kelsey Taylor as Traudl Junge. ©2015 Owen Sheppard.